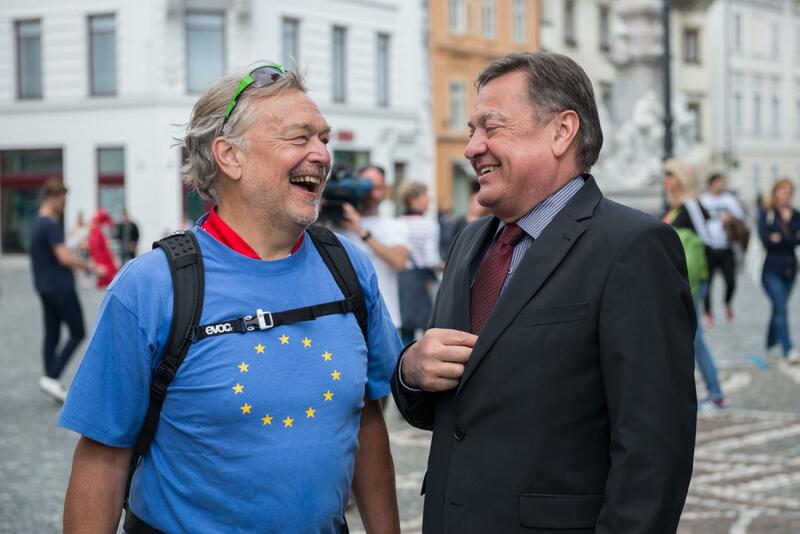 On Saturday, 14 May 2016, as part of the yearly cycling tour connecting European green capitals, Karl Falkenberg, Hors Class Senior Adviser for Sustainable Development at the European Political Strategy Centre within the European Commission, and EU Green Bikers team arrived to Ljubljana – European Green Capital 2016. He was welcomed by Mayor Zoran Janković and Deputy Mayor Tjaša Ficko in front of the City Hall. This year, the cycling tour has a special connotation, since it became charitable as well. Karl Falkenberg used the opportunity to donate funds he had raised during his tour to the society Zeleni prstan (Green ring) bringing together supporters of nature, culture and healthy lifestyle and all who want to preserve the significance, purpose and image of the Path of Remembrance and Comradeship. The Path of Remembrance and Comradeship is the longest tree-lined city avenue, circular path surrounding Ljubljana with more than 7 000 trees along 34 kilometres. It is a popular cycling running and walking route but also a memorial to the suffering of Ljubljana’s citizens during World War II. Karl Falkenberg was the Director-General for the Environment in the European Commission and the President of the jury, which in 2014 awarded the title European Green Capital for 2016 to the City of Ljubljana.